and the story told by John Piippo, who came to Red Wing in 1866, was a harrowing one. Southern Minnesota counties: 1. Goodhue; 2. Blue Earth; 3. Brown; 4. Cottonwood; 5. Dakota; 6. Dodge; 7. Faribault; 8. Fillmore; 9. Freeborn; 10. Houston; 11. Jackson; 12. 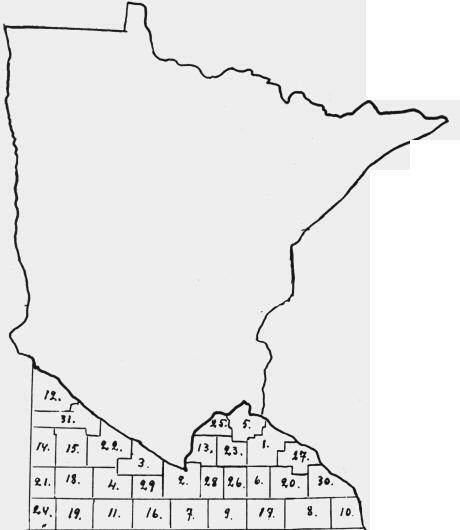 Lac qui Parle; 13. Le Sueur; 14. Lincoln; 15. Lyon; 16. Martin; 17. Mower; 18. Murray; 19. Noble; 20. Olmsted; 21. Pipestone; 22. Redwood; 23. Rice; 24. Rock; 25. Scott; 26. Steele; 27. Wabasha; 28. Waseca; 29. Watonwan; 30. Winona; 31. Yellow Medicine.